Golden has lots of great options for food, but I have to say that one place has risen above the rest when it comes to a classic American burger! Of course this is my opinion, but because I work right in the heart of downtown, you can bet I have tried everything! I hate to admit how many times I have eaten out in Golden, but lets just say that packing a lunch every day rarely crosses my mind. Bob’s Atomic Burgers has my vote as the best burger in Golden. Not only are the owners great people who contribute a lot to Golden non profits, and the community on the whole, but the burgers are amazing. The burgers come sizzling right off the grill, fresh as can be. There are a plethora of choices for toppings from a fried egg, to grilled green chilis and much more. You have a large choice of sauces as well, from the hottest of hot sauce, to A1 steak sauce, to ketchup and mustard. For those who need a healthier meal, try the quinoa burger. I have never tried the quinoa, but my wife loves it!! We have been here many times with friends, family, and my real estate clients. No one I know has ever left dissapointed. 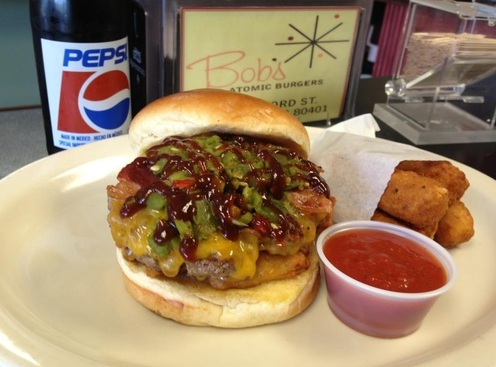 For a classic all american burger experience, give Bob’s a try. For more see the website below.